New Delhi: The 22nd meeting of the Board of Directors of Kochi Metro Rail Ltd. was held in Delhi on 18th August, under the chairmanship of Shri. Madhusoodan Prasad, Secretary, Urban Development and Chairman, Kochi Metro Rail Ltd.. The Board has approved the Detailed Project Report (DPR) of the integrated watertransport system for Kochi and took note of the status of the Project. KMRL has engaged a consultant for enhancing customer experience in the metro rail system, and in line with this endeavour, it is felt that it would beappropriate to theme at least some stations around certain basic concepts that would strike a chord in the people of the city and enhance Kochi’s valueas an international tourism destination. Based on this, it was decided to theme the entire system based on western Ghats, for also to make awareness of the rich natural blessing we have got and to remind the importance of keeping it protected. 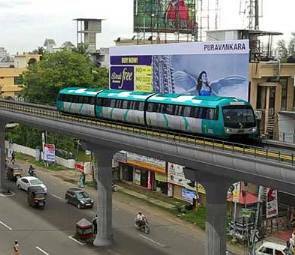 The Board took note of ‘thematic design concept of stations’ for Kochi Metro. The themes decided for Kochi Metro stations are Western Ghat (Overall theme and special focus on Aluva), Maritime history of Kochi ( CUSAT), Spice route (Edappilly), Art, culture and literature of Kerala ( Changampuzha Park), Sports heritage of Kerala ( JLN Stadium) and Special focus on history of Ernakulam/ Kochi (M G Road). The Board approved the Annual Accounts for the year ending 31st March 2015.The total expenditure up to 31st July of the current financial year is Rs. 352.95 crore. The major expenses incurred in the financial year 2015-16 are DMRC project payment of Rs.310.00 crore and DMRC remuneration of Rs.15.32 crore. The board took on record the resignation of Shri Ved Mani Tiwari, Director, Systems, KMRL and constituted the committee for the selection of Director,Systems in KMRL. The board also reviewed the project progress and the schedule of progress for the next few months.